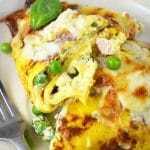 These Crespelle (savoury crepes) are stuffed with ricotta, peas and ham and baked with a delicious Fontina cheese sauce! Mix the flour and eggs in a large bowl. Gradually add the milk and the melted butter, whisk to as smooth a batter as possible then set aside for half an hour. Boil the frozen peas in boiling water for a couple minutes then run under cold water to stop them cooking any further. Add the ricotta and egg to a bowl and mix together. Add the cubed ham, peas, basil, parmesan and a pinch of salt and pepper. Mix to combine. Preheat the oven to 180°C/350F/gas mark 4. Lightly grease a large frying pan with a small knob of butter and place under a medium/low heat. Add a ladle of crespelle batter to the pan and swirl to form a crespella. When the top of the crespella starts to look dry, flip it over and fry the other side for a few seconds. Continue with the rest of the batter (you should have 8 crespelle). Melt the butter in a saucepan then add the flour. Stir to a thick paste and cook for 1 minute. Slowly add one-third of the milk whisking constantly. When it starts to thicken add another third of milk and repeat until you’ve used all the milk. Add the fontina cheese keeping around 1 tbsp for the topping and stir until melted. Lay a crespella out on a clean surface and cover one half with some of the filling (around 2 tbsp). Fold the crespella in half and then in half again (you can also roll them length ways if you prefer). Add it to a baking dish and repeat with the rest of the crespelle. Cover with the cheese sauce and top with the remaining tbsp of fontina cheese then bake for 20-25 minutes. Serve.